A great post on SaaS from Clement Vouillon of Point Nine Capital. 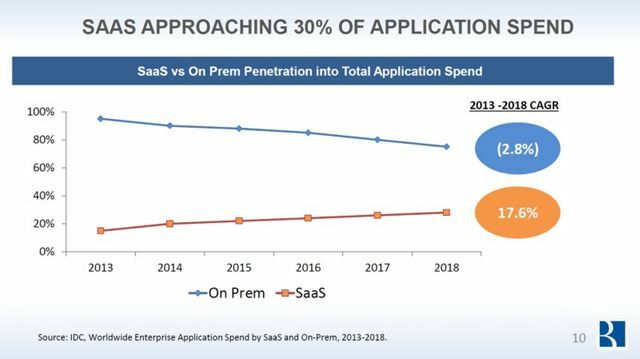 Growth in SaaS has comprehensively outstripped on-premise software in recent years, and it now accounts for 30% of overall application spend. In some horizontal applications like CRM, SaaS is already the dominant model. There is still plenty of opportunity in many verticals, and in niches, so companies need to be clear of their value proposition and differentiation. We continue to see strong demand from buyers for SaaS. Recent clients including NetDespatch, a specialist in SaaS shipping and parcel data management for e-commerce, which we advised on its sale the Royal Mail, to bring advanced cloud based shipping and tracking solutions for e-commerce to this "old economy" giant. M&A in artificial intelligence; who’s buying what? What makes a good CEO?